With offices in downtown Palo Alto, Los Altos, and surrounding Silicon Valley areas, Alex Wang's residential real estate practice has served hundreds of households and families in some of Silicon Valley's most desirable real estate markets. Stand out when selling your home. We'll show you how specialized custom marketing, local knowledge, and strategic negotiation will position you to get the highest price for your home. Whether you're a first-time buyer, move-up buyer, or investor, our client-first approach means you’ll reach your goals faster. We bring objective insight and a strong negotiation background. While Alex works in the entire Redwood City to Sunnyvale area, he really specializes in Los Altos / Mountain View and even knows most of the agents that work there, which gives him a huge advantage. Being on the winning end of a multiple-offer scenario is so much more likely when Alex has a solid relationship with the selling agent. We worked with Alex over the past twelve months to find and buy a new house and then to sell our original house. …. We ended up selecting Alex and have never regretted that decision. Alex is terrific. Integrity is the first word that comes to mind. And besides being very knowledgeable and organized, he's also very calm and this was very helpful to us through-out the complicated process of house-buying and selling. Alex and his team provided excellent assistance in regard to our Palo Alto property. They were extremely competent, professional, and responsive. We appreciate their help and look forward to a continuing relationship in regard to our real estate needs. Alex’s focus on negotiation strategy throughout his career is one of his strengths as a real estate agent, and sets him apart in Silicon Valley’s competitive, high price point, and quick moving real estate market. His negotiation style focuses on creating value for both sides of the transaction, resulting in a higher selling price for his sellers and a better chance of reaching the goals of his buyers. 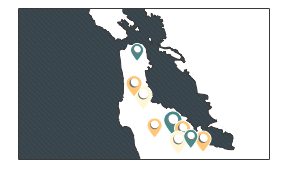 The Bay Area reflects a vibrant culture of communities and homes along the Peninsula, along with a desirable job market, top-ranked schools from elementary to college level, and excellent weather for outdoor activities. As a result, the real estate market here is one of the top in the country and always a point of conversation. Understanding the unique neighborhoods and real estate markets of the Bay Area enables buyers and sellers to make the best decisions and is necessary knowledge for successful real estate agents. Alex’s long professional experience in the area allows him a strong advantage when helping clients buy or sell a property. With offices based in Palo Alto and Los Altos, along with residing in Los Altos, he works and lives in the communities he represents daily. Alex is committed to local Bay Area communities and is always looking to see how he can make a positive lasting impact. One of Alex’s first contributions to the Sereno Group was to help lead and implement the "1% for Good" program, where agents and offices as a whole can elect to donate a portion of their earnings to local charitable and community-minded organizations.